A classic cartridge that has been with us since 1978 and is now in its fifth revision. 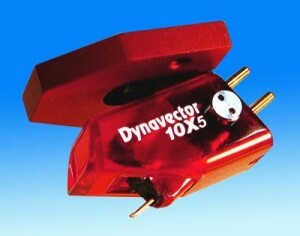 Exquisitely made (like all Dynavectors) the 10X5 is the companyâ€™s entry model and is also a high output moving coil design. Itâ€™s a perfect upgrade for those vinyl addicts who are moving up from a moving magnet design as it sounds glorious into any good quality MM input. We recommend it as a great step up from the excellent Rega cartridges on turntables like the RP3 and P7 as well as being the perfect partner for those music lovers who are beginning an affair with Amadeus (of the Well Tempered variety). Itâ€™s a stunning shade of red too !